Day of Giving is New Eagle’s day to give back to our community. 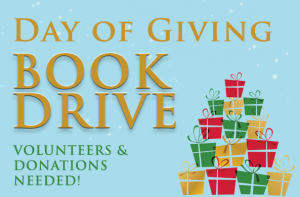 This year, we will be collecting donations of NEW books on behalf of T&E Care’s Holiday Drive! We are asking parents to either DONATE BOOKS, or VOLUNTEER to help wrap the books donated. Last year, almost 500 books were donated!! Let’s see if we can beat that!! Book Donations: Books should be NEW children’s books targeted for preschool through middle school-aged children. Please note, there is a particular need for middle school-aged books. Books must be non-religious and be of interest to all cultures. IMPORTANT: Please attach a gift tag to each book. Books can be donated in the New Eagle lobby now through December 3rd. If you will be donating books, we ask that you complete the form below for planning purposes. Wrapping Volunteers: We are in need of MANY volunteers – please help! We are seeking volunteers for 40 minute shifts, and you can choose a slot during which your child’s teacher/classroom will be wrapping! Get the Volunteer Sign-Up Sheet! We sincerely thank everyone who participates by donating books and/or volunteering – what a wonderful way to teach our students about the spirit of giving!